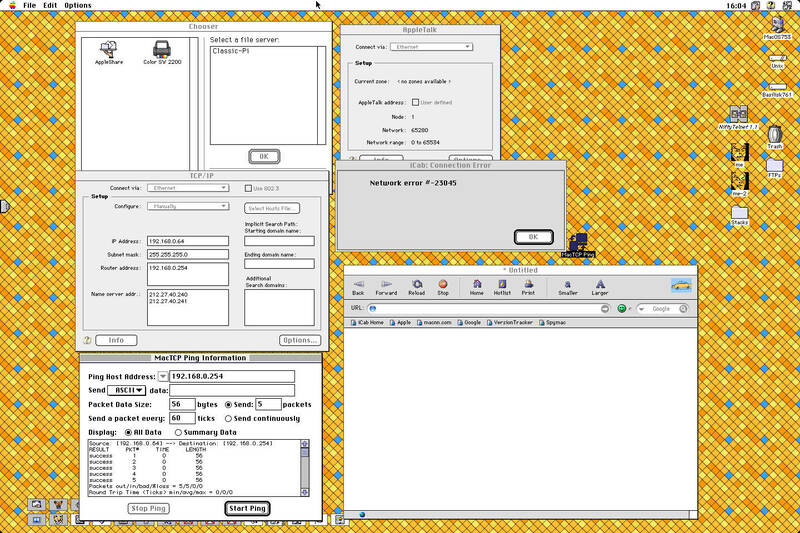 I managed to compile sheep_net.ko ethernet driver on Debian 8 PPC (on a PowerBook G4), it loads and all fine. But , even though I set TCP-IP manually, it doesn't want to get on the internet, only Appletalk works, I can see other macs on the network via the the selector. Does someone knows of something on Debian 8 preventing BasiliskII from having his own IP address ? Or does it came from the sheep_net.ko being incompatible ? Do you assign unique IP address to emulated Mac? I confirm that http (TCP) and ping (ICMP) works in latest Fedora 24. Yes , I assign 192.168.0.64 to the emulated Mac. And Debian 8 host use 192.168.0.4. Since, you confirm AppleTalk work. It imply that ethernet layer, aka layer 2 works. 1. 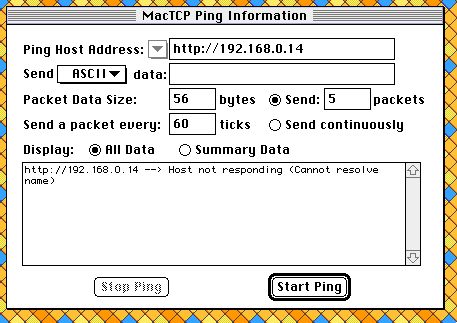 Run MacTCP Ping. confirm if ICMP works. Ping to your router with IP address. 2. If 1st step work, confirm if DNS and gate way set correctly. Ping to any URL www.nytimes.com. 3. If 2nd step work , test TCP. Use web browser to test TCP. At any time, you can download wireshark to sniff packet. I'm writing some doc on how sheep_net work. If you are interested in details, I'd share with your. But if I try a connection with icab, I get that error "-23045". Connections also fails with other browsers,or if I try connecting through IP with Timbuktu to another Mac. And indeed , AppleTalk works, my R-pi running BasiliskII appears in the Chooser and I can mount it. Timbuktu also connects to it through Appletalk. One more thing, please make sure virtual Mac OS IP, ie 192.168.0.64 has no conflicts with other in you subnet. Supposedly you can ping from other box to this virtual Mac OS IP but it show the same Ethernet address as your host. If you add 8.8.8.8 to the top of your name server list, does that fix the problem? Trying to connect to http://74.125.232.241 from icab fails too, no error mesg though, it just "check" forever... a MacTCP ping to the same address gives the same "Host not responding (Cannot resolve name)" result. I've checked my router configuration, no problem with that 192.168.0.64 address I've assigned, it's free and available. though they work fine on the R-Pi BasiliskII... Still no success. Try ping 8.8.8.8. It is possible that you can't even ICMP to outside. 1. 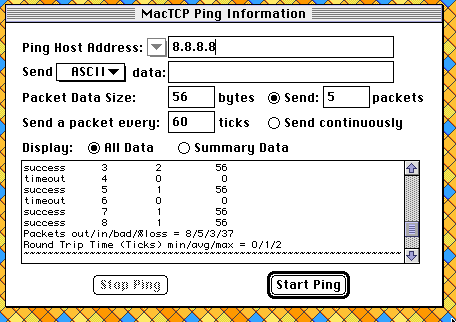 Ping 8.8.8.8 works with some time out means that you can ICMP to outside network, ie internet. Your sheep_net module works for ICMP. 2. 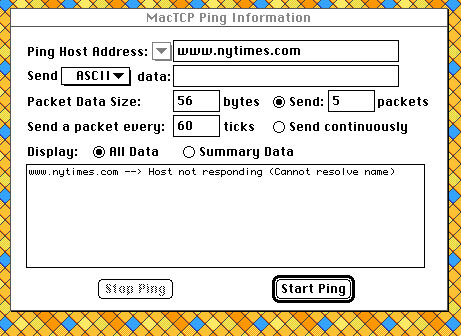 I'd suggest that set DNS as 8.8.8.8 and ping with url "www.nytimes.com" (no http) and see if it can resolve name. 3. If not, that mean UDP doesn't work either. So it may be IP layer issues. You need wireshark or any packet sniffer to run in your host for further debug. I think somehow it is IP protocol doesn't work in BII. The sheep_net module use so called IP aliasing old technique. It use different IP address for the same ethernet MAC address. In theory, it should be still OK. Because Linux hasn't dropped support this feature yet. Tried 8.8.8.8 as DNS and ping to http://www.nytimes.com. no success. Note : I have this problem only when building sheep_net on debian 8 Jessie PPC, I have another PB G4 with Jessie and it's the same trouble. On other machines running Debian 7 Wheezy PPC it works fine. Also sheep_net works fine on the R-Pi with Rhaspian 8 jessie , but only if I don't update the R-Pi firmware and don't do upgrades. So I've left the R-Pi Jessie at a certain state. if I upgrade, no more sheep_net. Even you know how to use it, there is still some obstacles. To me, I have no idea how BII inside working after tracing Ethernet interrupt part. There are knowledge gap here and there to prevent me. It seems to make it work. But I'm not so sure if that's the trick. I just did a "git clone https://github.com/cebix/macemu.git" to get the all thing. But that was some weeks ago. Shall I try that lastest commit dc11229 from 3 days ago ? Last edited by galgot on Tue Aug 16, 2016 5:28 pm, edited 1 time in total. 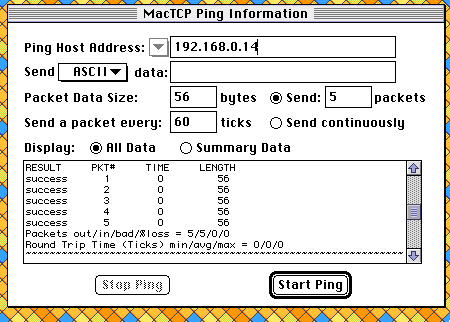 Just for clarification: you can't ping http:// -- ping is icmp:// and http:// is a different protocol. The ping client you're using doesn't understand URIs at all, and can only take a domain or IPv4 value. 8.8.8.8 is Google's domain name server, which often works significantly better than the one provided by your ISP. It does mean, however, that Google is tracking the domains you look up (instead of your ISP tracking them). Using 8.8.8.8 also means that if your ISP is doing traffic shaping based on domain lookups, you've just routed around that. just tried accessing http://192.168.0.14 (local web server) with iCab, and it's fails too. No error mesg , but keeps checking forever. I suspect that from sheep_net module mess up ethernet packet size. But it is only copy up to count. You can try a dirty fix to bump up L931 to 1518 as google show the maximum ethernet packet size. Give a try and let me know. ...but still no joy in BasiliskII. or is it "1516" that I should change to "1518" ? No, first one is for tap. Yours is otherwise, ie NET_IF_SHEEPNET. One capture per test with filter and post it here. Ok, I've installed Wireshark. But as i said, have to learn how to use it, it's very new to me . Today, I could replicate that sheep_net module didn't work, either. When ping to my gateway IP from guest OS, I found that host PC sent out ICMP with type 3 error code 10 to inform gateway/router that guest OS IP is not reachable. I can disable ICMP by iptables in host OS. But it doesn't work, either. Interesting? Because sheep_net module take in multicast packet, you will see a lot of noises in wireshark. I kind of figure it out that. BII didn't receive DNS response packet from sheep_net module. Now I need to figure it out why. This early morning, I analyzed and compared the BII hex dump packets from wireshark and packets captured in host. I found that the host PC kept on sending ICMP to my router and saying that guest OS IP is not reachable. Now, I can't replicate the issues any more. I'm not sure if I feel happy or not. 2. Open wireshark on host PC and capture packet. Keep /tmp/hexdump.log from 1 and packet from 2. Notify me by opening issues in my macemu git repo. This is most painful thing if it can't replicate every time.